It’s 9am on October 4, and beneath central London's grey skies, environmental and social justice activist Kate Wilson stands outside the imposing, jagged gates of the Royal Courts of Justice, awaiting the start of an extremely important Investigatory Powers Tribunal hearing. She's joined by her legal team, a colorful legion of supporters, and numerous journalists and photographers. To understand their presence today, one must travel back to 2003, when she met and fell in love with fellow activist Mark Stone. A seemingly perfect match, with much in common and many shared interests and dreams, they quickly became romantically entangled — travelling together, living together, sharing their most intimate secrets with one another. The relationship would end amicably after two years, and they remained very good friends, maintaining regular contact until October 2010, when Kate received a devastating phone call from a friend. 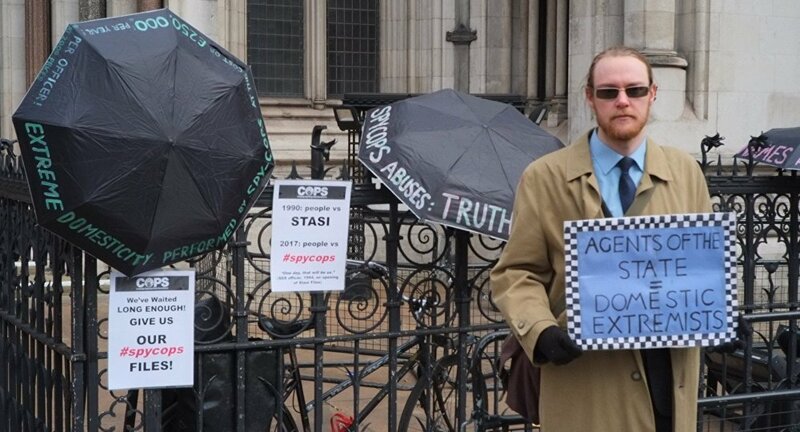 They'd rung to inform her Mark Stone didn't actually exist — he was in fact Mark Kennedy, an undercover officer in the Metropolitan Police's National Public Order Intelligence Unit, who for seven years had infiltrated and spied on protest movements across Europe. Ever since, Kate has battled tirelessly for answers. In 2011, her fight became a fully-fledged legal one when she along with seven other women deceived into intimate relationships by undercover officers sued the police for deceit, assault, misfeasance in public office, and negligence. In response, Kate says, the police did "everything they possibly could" to prevent their cases reaching trial — in one particularly egregious instance, claiming the romantic relationships undercover agents engaged in were based on "genuine feelings" — and to make matters even more agonizing, they were obliged to make deeply invasive disclosures about their private lives along the way. 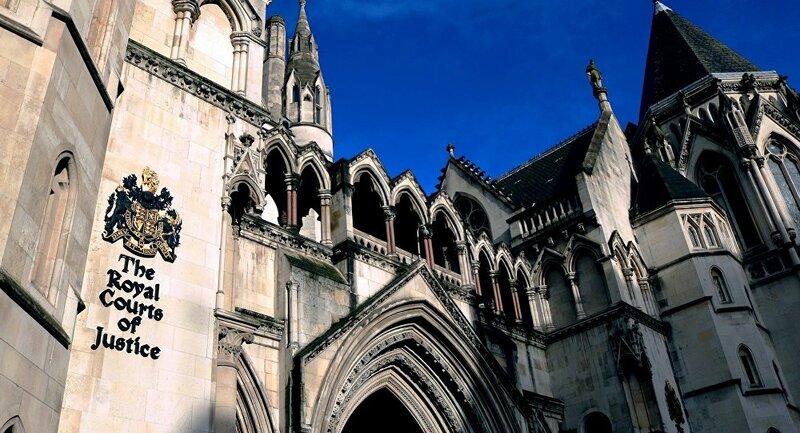 When these obstructive efforts failed, and the prospect of being compelled to disclose potentially damaging evidence in open court became very real, in November 2015 authorities withdrew their objections and sought to settle out of court, offering claimants sizeable compensation. They also issued an apology — since removed from the web — admitting undercover officers' romantic affairs constituted "a violation of women's human rights, an abuse of power and caused significant trauma". Any suggestion these relationships had been sanctioned, much less even known about, by senior officers was robustly denied. "[Such relationships] should not happen…[they] would never be authorized in advance nor indeed used as a tactic of a deployment," it was claimed. The truth was and remains far more important to Kate than mere monetary reparation, so she rejected the proposed settlement, and continued her fight in the Investigatory Powers Tribunal, a judicial body which hears complaints about surveillance by public institutions. In particular, she contends police breached her human rights under Articles 3, 8, 10, 11 and 14 of the European Convention of Human Rights. Almost three years have passed since then, during which true to form the police have attempted to stop the case in its tracks via a number of different legal methods — no such effort has succeeded so far, and resisting each one has produced several small but seismic admissions. For instance, in March authorities conceded they'd breached Kate's Article 10 and 11 rights for the first time — and acknowledged Kennedy's cover officers and line manager were aware of their relationship, and actually acquiesced to it. Kate also learned police hold 10,000 files on her — of which she's managed to secure the release of 200 so far, although over 100 are completely redacted. "On the 80 or so readable pages, my name appears 52 times. I was a named target of Kennedy's surveillance operation, not just someone he just happened to come across and take a liking to, or used as a means of shoring up his false identity in activist circles. The pages record 11 occasions on which Mark stayed at my parents' home, describe how his handler watched me do all sorts of things, like collecting him from the airport…of course, when we met we would've kissed, and his handler would've seen it. I need to know the full picture — how many people knew, who they were, and whether even government ministers were aware," Kate tells Sputnik. Furthermore, she believes it "essential" the IPT investigates her claims beyond those related to the sexual relationship — while the "most extreme" surveillance tactic she was subjected to, it was but one fragment of a vast operation, in which her privacy was frequently and comprehensively violated by at least eight undercover officers (including Kennedy) over the course of a decade. She also now thinks it clear they sought to direct and influence her personal and political activity according to their operational objectives. 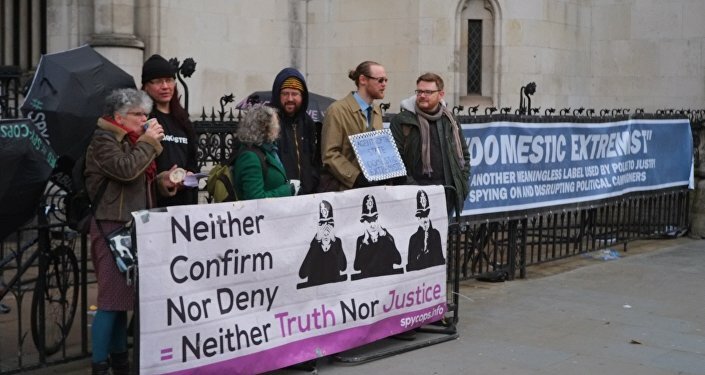 The October 4 IPT hearing represents yet another attempt by police to derail Kate's struggle, in which they'll argue the political spying operation she fell victim was quite so vast, it's simply too expensive and onerous to effectively examine, and the tribunal should be abandoned outright. It will however be the very first time facts and evidence in the case are looked at by anyone other than police themselves. 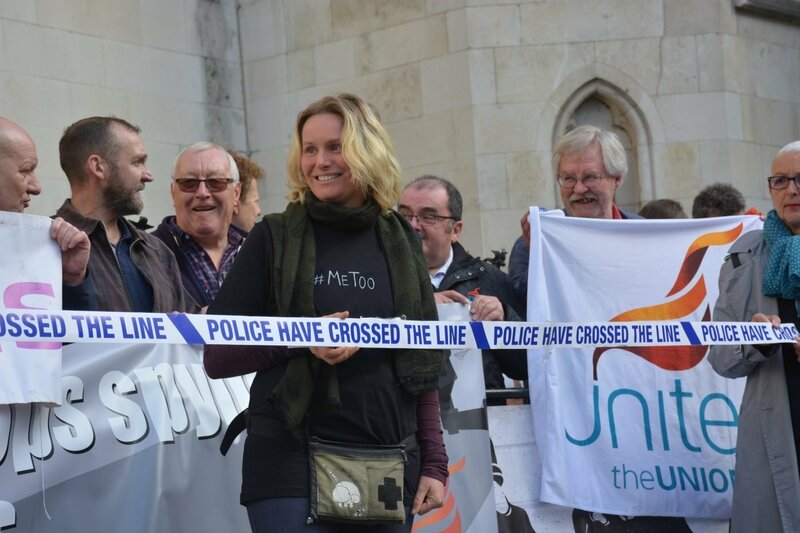 Naturally, Kate's assembled supporters are immensely keen for authorities to fail — many are likewise victims of undercover polic spying — but their experience of the Undercover Policing Inquiry has given them no cause for optimism. 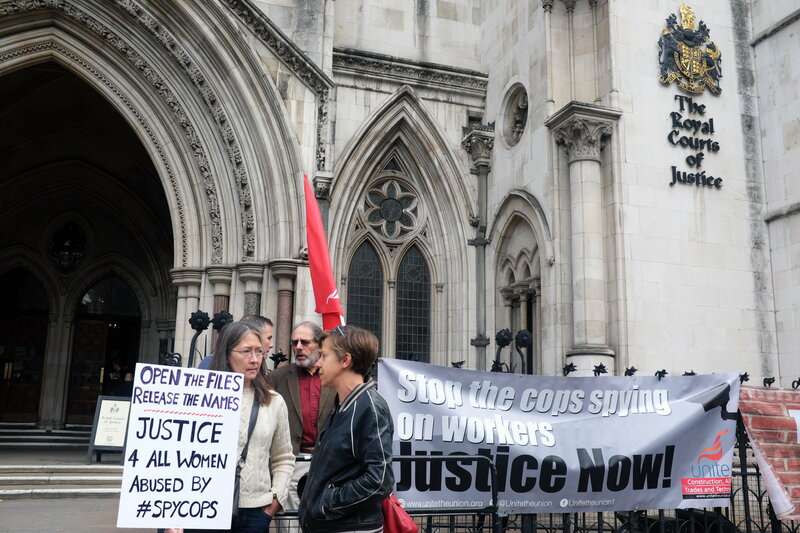 Established by then-Home Secretary Theresa May in March 2015, it has spent almost four years — and well over US$10 million — achieving little for the victims of police spying in the UK and refusing to reveal much information of significance. On March 21 core participants staged an en masse walkout, demanding chair John Mitting appoint a full panel to oversee its work, or stand down. Tom Fowler, one of the individuals who stormed out of the UCPI five months ago, is among Kate's well-wishers. He hopes to see a "better class of justice" on display at the hearing than has been exhibited at the UCPI so far, which he says has been "shameful" — but he's not holding his breath. "The police scuppering Kate's case today would be a complete affront to British democracy and justice. It's absolutely disgusting it's taken so long for her to get here — although even the very limited revelations to arise over the course of her fight have been huge, blowing police lies out of the water and totally discrediting their apologies," Tom tells Sputnik. His scepticism is shared by many others in the crowd, but as the hearing's scheduled start time of 10:30am looms, most hurriedly follow Kate through the Courts' heavy oak doors to the grand marble-floored entrance hall, past security and carvings and statues of eminent judges, lawyers and Biblical characters, and into a labyrinthine warren of passages and stairways, which eventually leads to the hearing room. Under the intense glare of halogen lights, three judges and a public gallery full to capacity with Kate's supporters, police consul David Perry set out at some length a variety of different arguments for why Kate's quest for truth should not be allowed to continue. His contentions would variously elicit outrage, disgust, amusement and anger in all attendees — including judges. He prefaced his comments by stating the police were absolutely not trying to hide facts from public view, and were in fact eager to assist Kate — the irony of his statements was lost on no one, eliciting a ripple of bitter guffaws from the audience, the first of many to erupt over the course of his oratory. The only issue for police, Perry explained, was whether a "legitimate purpose" would be served by full disclosure of all documents held on Kate. After all, her surveillance was "properly granted and fully lawful", and in any event, the intimate sexual relationship engaged in by Kennedy — "briefly", he incongruously stresses — is currently being scrutinized by the UCPI, and internal investigations such as Operations Herne and Elta. Besides, he asserted, police documents don't conclusively prove Kennedy's superiors had any idea about the nature of his bond with Kate. The shock and revulsion at his assorted intimations evident in the faces of every member of the public gallery mirrored the expression of judge Graham Zellick, who immediately interjected. "Based on the materials I've seen, it's inconceivable they didn't know! The only question is how high up the knowledge went!" he fulminated. "That may be a matter of interpretation," Perry responded, a riposte provoking such raucous audience laughter panel head Lord Justice Ravinder Singh was forced to beg for quiet, allowing the police consul to continue his circumlocutory, discursive statements — which were equally poorly received. "Disclosure would cost hundreds of thousands of pounds," he blustered, "Metropolitan Police funds are finite and under a great deal of pressure." This argument elicited another intervention from Zellick, whose disdain for the suggestion police just couldn't afford to reveal potentially incriminating files was obvious — he reminded Perry of the powers the IPT exerted, and the responsibility authorities had to engage with the Tribunal constructively. With each argument outlined by Perry having been derisively rejected, the police legal team were reduced to desperately requesting yet more time — three months — to collate, consider and release the evidence relevant to Kate's case. When the time came for Kate's consul Charlotte Kilroy QC to stand and deliver, she read shocking excerpts from police files dated 2004 — 2006, a period covering most of Kate's relationship with Kennedy. The pages documented trips the couple made to cinemas, museums, and even a charity carol singing concert arranged by her mother, as well as holidays to the Lake District and elsewhere — and much, much more. The level of in-depth detail constantly divulged by Kennedy and others starkly exposed just how thorough Kate's surveillance was — one page noted Kennedy visited Kate's parents' home to "[fulfil] a promise to clean windows" as they were "high up" and Kate's mother "had a bad back". A perceptible shudder undulated through the public gallery when Kilroy read a series of emails Kate and Kennedy had exchanged — the correspondence, which included highly intimate content, would've been read by Kennedy's cover officers and line manager, if not higher level back office police staff. The files also laid bare the significant degree to which operational objectives directed Kennedy's behavior in his relationship with Kate, with one document revealing Kennedy had sought and received permission from superiors to spend up to US$100 (£80) on a used mountain bike for her, in order to "facilitate ease of travel around and also maintain contact". Elsewhere, Kennedy was granted authorization to lend Kate money to attend political events, in order to "raise [his] standing with her and allow her to socialize during visits thereby affording [Kennedy] more opportunities to develop new contacts". Others detailed the covert ways in which Kennedy undermined her campaigning, including her plan to work with refugees on the Thai-Burmese border. In all the files, Kennedy apparently saw no need, and made no effort, to conceal the nature of their relationship from his immediate superiors — a strong indication, Kilroy argued, it was approved of by his entire chain of command. Further underlining the case for high-level knowledge, in a rare moment of disclosure the police legal team acknowledged a criminal investigation into Kennedy's undercover activities — Operation Montrose — was currently underway. Arguments and statements exhausted, at 1pm the judicial panel halted proceedings in order to deliberate privately, asking attendees to return at 3pm. However, it would take until almost 4pm — a surely nail-biting period for all concerned — for judgment to be served by Lord Ravinder Singh. ​To many barely suppressed gasps of delight, he announced Perry's arguments were not accepted — the case would proceed and be heard on its own merits. He also ordered police to provide a fully pleaded defence to all aspects of the claim, supported by witness evidence and full disclosure of all relevant documents. Lord Justice Singh also made clear the IPT would examine the legality of the operations of all officers who spied on Kate, obliging police to present background documentation on and explanations of how and why their activities were authorized. The ruling was far from unalloyed victory — no binding judgments were made on any of the specific issues raised by the case, let alone the case itself, and authorities were granted the three months they'd inexplicably requested. Evidently, for Kate this is not the end — or even the beginning of the end — of her quest by any means, but it is perhaps the end of the beginning, as the strident cheers that spontaneously broke out among her supporters upon their exit from the Courts surely attested. Reflecting on the day's events, Kate's mood is decidedly mixed, although that's partially because she's so thoroughly exhausted by proceedings. Understandably, the only thought on her mind is a well-deserved early night — although she broadly welcomes the Tribunal's ruling, saying it's "refreshing" judges "understood the way police were approaching things", and viewed their "stonewalling" as unacceptable. "The IPT made the UCPI look like an absolute sham — unlike Mitting's farcical inquiry, they refused to take police claims at face value, and made clear internal documents must be released so they can make informed rulings and decisions. I'm hoping police comply with the IPT's orders, but it's important to note ‘full disclosure' in this context doesn't mean they're going to hand all the documents over. They're just being asked to release statements and evidence via a legal forum, in which they'll still have an opportunity to plead their case. It's amazing it's taken eight long years to get to this point," Kate tells Sputnik. Still, she concedes the Tribunal's approach "could be very encouraging", and was heartened by Zellick's declaration it was "inconceivable" Kennedy's superiors didn't know about their relationship. "What comes of today is anyone's guess — I don't know whether any future trial that arises will be secret or held in open court, or whether I'll be given any kind of access to some or all of the 10,000 documents held on me. Ideally, I'd prefer not to think about my battle at all for the next three months, and devote my energies to other, more positive things — although my conviction that it's vital to properly understand what happened, and examine the systems in place that allowed it to happen, remains as strong as ever. Until I get resolution, I'm not going to give up," Kate concludes.